Hard work and determination propelled these Mean Green student-athletes to the NFL. Alumni Eli Young Band entertained at UNT's annual celebration. UNT welcomes Grant McCasland as the new men's basketball coach. Student dreams of becoming a doctor -- but how to pay for his education has always been a concern. May 2017 graduate Marisa Nowicki shares her thoughts on her UNT experience. UNT celebrated commencement with a new fun-filled tradition. 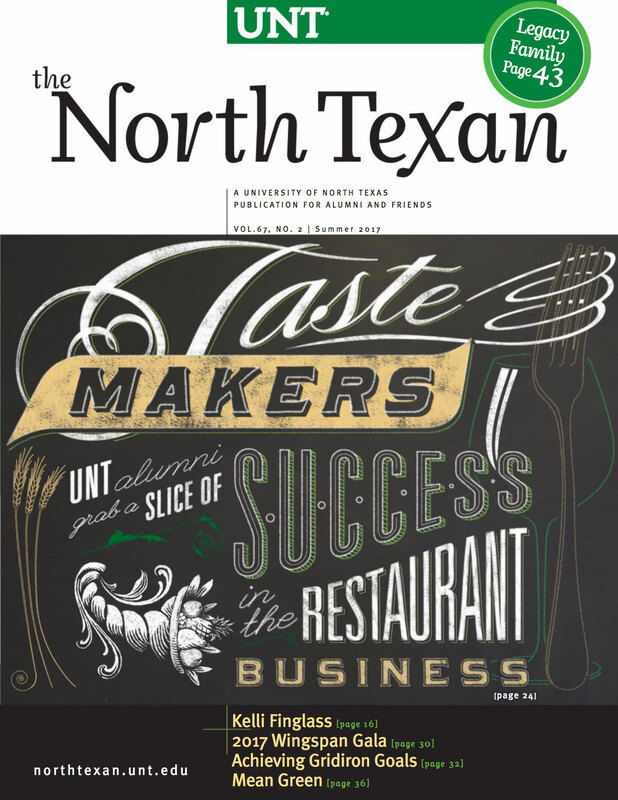 UNT celebrates the Class of 2017 and another year of progress. Alum Rick Bogart features mentor's opera recordings in new CD. Learning technologies researcher awarded a Fulbright Senior Specialist Scholarship. UNT hosted the annual Flag Parade, Autism speaker Temple Grandin and Luminarium art exhibit. UNT researchers are helping to make U.S. Army tactical shelters stronger and easier to transport. Alum Claire Legrand's novel was nominated for an Edgar Award for Best Juvenile Book. Doctoral student received $20,000 to facilitate her service to underserved minority populations. Watch videos of the 2017 Presidential Award winners. Alumna Jennifer Evans-Cowley named provost and vice president for academic affairs. Institute for the Advancement of the Arts fellows work on textiles, a musical and an opera. Bob was a wonderful colleague, friend and role model. Emergency management faculty study natural disaster recovery times with Purdue researchers. Retired English professor Ann McCutchan recalls her life on the Florida space coast in the 1960s. Materials science professor partners with Argonne National Laboratory on anti-reflective coating. More than 8,900 graduates in 2016-17 made it a record-breaking year for UNT. TAMS students recognized in 2017 Barry M. Goldwater Scholarship competition. Art history professor Kelly Donahue-Wallace examines the life of the Spanish engraver. Consider joining the alumni association for fun-for-all-ages excursions. UNT celebrates the power of music, NASA competition and president's 10,000th Twitter follower. Matt Morton's National Endowment for the Arts award allows him to focus on poetry. Three UNT professors use NSF grant to study effects of political conflict on language and culture. Family enjoyed the new block party for graduates. Colleges launch new programs and provide students with support and high-demand skills. A major in dance also helped Rachel Caldwell develop her skills as a writer. UNT literary and visual storytelling project received a 2017 Sen. Paul Simon Spotlight Award. Alumnus Rich Redmond's drumming took him from the One O'Clock Lab Band to Nashville. Alumnus Shaun Martin infuses his love for gospel and jazz into his music. Biology professor Kent Chapman turns a family project into a children's book. Professor John Ishiyama was one of 10 in Texas honored by Minnie Stevens Piper Foundation for 2017. Where are the new buildings on campus? Doctoral student in music performance wants to build a strong voice program in Colombia. UNT's College of Information received a national award for international research collaboration. Communication design professors edit new American Institute of Graphic Arts journal. Alumnus John Liddle is a radio broadcaster and National Anthem singer. Pamela Padilla was one of 15 chosen to attend institute for leaders in STEM fields. Faculty member Rachel U. Mun recognized by National Association for Gifted Children. Professor's artwork illuminates human rights issues around the globe. Ethnomusicology study abroad trip to Ghana inspires alum Daniel Foose's CD. Gerontology professor Stan Ingman offers advice.